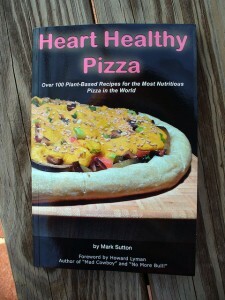 I have been on a pizza kick recently thanks in part to Mark Sutton’s book, Heart Healthy Pizza. It was a book I had been looking to buy for a few months, but I seemed to get sidetracked and would end up order other cookbooks. Prior to finding Mark’s book I was creating healthy pizza recipes, but they were more of a “traditional” pizza . I had tried to create my own version of a veggie pizza last year. It’s wasn’t anything overly impressive, I used a package of Bob’s Red Mill GF Pizza Crust, substituted my spaghetti sauce as pizza sauce (mistake) and piled on the veggies. I even added Daiya to the top of the pizza for those I were feeding who were not plant-based eaters. While the pizza came out okay it was still lacking. Pizza as I knew it growing up came from Round Table Pizza. It was usually sausage or pepperoni or cheese, obviously full of fat, highly processed and dripping with oil. Pizza in college was all about what was affordable. “Pizza. Pizza.” was usually the cry and their 2 for $5 deal. Again, not a healthy option, but it was how I knew pizza. Over the years my mom made some pretty good pizza and I have experienced pizza from California and Chicago to New York. Everyone has their own idea as to what makes a good pie. It was December, 2012 when I first learned about Mark Sutton and his book. It would be April before I finally purchased Heath Healthy Pizza I was thrilled to look at all the different options I had at my fingertips. To be honest I had to ask Mark on Facebook, his recommendation for my first pie. Not only did I have to select the crust, but sauce(s) and toppings I was going to us. It appeared a but more complicated that just unrolling some processed dough, squeezing sauce and tossing cheese and pepperoni on it. Gone are the days of processed ingredients, everything I make for my pizzas now are all homemade; from the dough to the sauce to some of the toppings. Mark’s got all the bases covered, sometimes not the most conventional of ingredients, but surprisingly enough they come together nicely and taste amazing. For example, the Pad Thai Pizza (pg 23) I made had a simple, yet delicious Sweet & Spicy Chili Corn Sauce on top of a brown rice, chickpea and cilantro crust. As I said, truly unique combinations. I was not too confident in working with dough and creating my own crusts. Yet last week I had the best success and honestly I thought I made a mistake, but one that worked to advantage. It was no mistake though, it was a basic whole wheat dough recipe from Mark’s book that demonstrated how quick and easy making homemade pizza dough truly was. I was so thrilled with the result I made pizza the next night, just to make sure what I experienced wasn’t a mistake on my part. Lo and behold, the dough worked and came out amazing! I never really looked outside the box when it came to pizza sauce. If it’s red, then call it pizza sauce. I mistakenly used my spaghetti sauce recipe for my pizza. It wasn’t the right sauce to use, but as Mark demonstrated sauce doesn’t necessarily need to be tomato based. A quick look of the book index shows you wide array of sauces, including non-cheese sauces including ingredients such as tofu, beans, rice, quinoa, oats, barley and millet. Each of these comprise a variety of sauces to top your pizza with. As I said, it gets a bit overwhelming when you start thinking how you are going to combine your sauce and toppings. Thankfully he does provide you with some “power pizza possibilities” in order to get you started. Prior to making my first Mark Sutton original, the Pizza Margherita (followed by the Nearly Nouveaux Mex), I actually make a BBQ Chicken Pizza from The Effervescent Vegan. A few Facebook comments made mention of Mark’s book and the rest is history. Let your imagination go, forget traditional pizza, give the ‘Really Reubenisque’ or ‘Clever Curry’ a try. There are no limits on pizza combinations. So many choices I am looking forward to expanding my pizza repertoire thanks to Heart Healthy Pizza. I’ll be honest, while I have gone through the entire book, I haven’t read each recipe in detail. I do believe Mark uses vegan sausage, like MorningStar Farms, Light Life and Gimme Lean in some of this recipes. I tend to skip the highly processed vegan sausage, even the crumbles since these are not any better for your than their meat counterparts. I did however have excellent luck in making my own pepperoni last night. Yeah, you heard me, pepperoni (it was actually the sausage). While Vegan Dad is no longer active, his blog remains and he ventured into the “mock meat” arena with some very good success. Whenever I have an inkling for a “meatless” meat I always check his site. I mistakenly used the homemade sausage recipe with excellent success last night, but called it pepperoni. Even from the first bite, my brain said, “this is sausage!” It was that good! Yet posting my success on Facebook I continued to refer to it as pepperoni, my mistake but it does give me a chance to make pepperoni tonight. So far everyone who has tried a slice thought it was tasty. The first test was my 7 year old son. He was a bit hesitant, but I cut him a small piece. His first comment, “can I have a bowl?” followed by “it’s spicy!” I will count that as a success. Next came my mother-in-law and wife. I was thrilled to have them taste test, as my wife is very picky and my MIL is a fantastic cook. My MIL raved about the flavor, alone and one a slice of pizza. My wife, much like my son thought it was a bit spicy, but good. She has never been one for really spicy food. At work I have given pieces to 3 co-workers and all have commented positively on the flavor and texture. While it wont’ be an every day food it’s great to know I have this meatless recipe as an option. As for Heart Healthy Pizza, well that is all I make these days. Thanks to a Mark Sutton for all his hard work and dedication to pizza. If you miss a slice or a pie now and then but don’t miss the cheese, oil and fat, his Heart Healthy Pizza book is the way to go. I just finished watching the documentary, Bag It this morning and believe this documentary will have the same sort of profound impact on “single use disposables” that Forks over Knives had on my health and the food I eat. I have not been dedicated to finding solutions for the sustainability of the planet. Like many I walk into a store, rip off a plastic bag, place my product in it. At the check out counter that plastic bag is placed in another plastic bags. Eventually these bags start to collect in the home. What do you do with them? 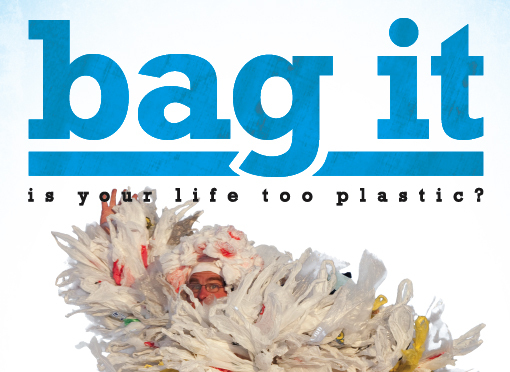 Bag It answers that and many other questions raised regarding the politics surrounding plastic, single use disposable, waste and recycling, ocean health and marine life and most importantly, human health. My journey didn’t start looking to “go green” or decrease my “carbon footprint” on society. When I decided to change my life, I looked at what I ate and learned what I shouldn’t eat, foods that promoted disease, sickness and even cancer were something I did not want on my menu. In 9 months my view on food and a plant-based, whole foods lifestyle has had a major impact on my life. All these health concerns from plastic, why shouldn’t I consider alternatives? It became obvious that the plastics industry and the American Chemical Council were not going to answer obvious health concern questions. Plastic has to be proven to be harmful to health, but those words were never echoed in this documentary. The numbers are staggering when it comes to the most common use for plastic. The plastic bag or “single use disposable” as it has become known. What was more surprising were the percentages of plastics being recycled, but oddly enough many plastics are not recyclable. The U.S. exports these bags to Asia, where they sort through and burn down those plastics that can be reused. Sounds healthy, huh? As important as human health is the effect of these plastics on the environment. I never new we had garbage patches in the major oceans of the world. The most studied has been the North Pacific Gyre or Great Pacific Garbage Patch. “Most debris consists of small plastic particles suspended at or just below the surface, making it impossible to detect by aircraft or satellite. Instead, the size of the patch is determined by sampling. Estimates of size range from 700,000 square kilometres (270,000 sq mi) to more than 15,000,000 square kilometres (5,800,000 sq mi) (0.41% to 8.1% of the size of the Pacific Ocean), or, in some media reports, up to “twice the size of the continental United States” (source). The impact these garbage has on marine life is shocking. Sea life and bird consume these pieces of plastic thinking it’s food, only to feed their young. When some of these creatures are dissected there is a considerable amount of plastic found. The Black-footed Albatross was one of the birds this film discussed on Midway Atoll. There was some comfort in knowing that some Pthalates have been banned and larger retailers pulled this items from the shelves. Many were infant related items found in Wal-Mart, Toys ‘R’ Us and Target. “Phthalates are a group of chemicals used to make plastics more flexible and harder to break. They are often called plasticizers. Some phthalates are used as solvents (dissolving agents) for other materials. They are used in hundreds of products, such as vinyl flooring, adhesives, detergents, lubricating oils, automotive plastics, plastic clothes (raincoats), and personal-care products (soaps, shampoos, hair sprays, and nail polishes)” (source). So what started out as one man’s quest, turned into a very eye opening journey. How can one plastic bag have such an impact? It does and many of us don’t think about the repercussions of these bags on a large scale. Bag It has me rethinking how I shop, opting for cloth bags and not using the plastic bags provided. This can be looked at as another starting point in my life. It comes as no surprise that this documentary lead to further discussion on “downsizing” and “decluttering.” At first glance this zero waste house could seem extreme, but if you really start to think about it, is it really? 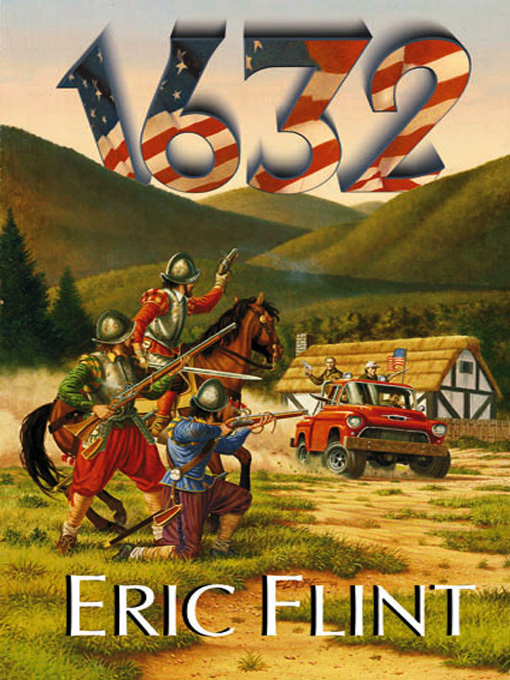 I turned the page, so to speak in December, 2011 when I took the recommendation of a co-worker and downloaded the first book in the Ring of Fire alternate history series from Eric Flint from titled 1632. Described as the “ultimate Y2K glitch” when the town of Grantville, West Virginia, it’s surrounding area and residents find themselves in the middle of war torn Europe and the Thirty Years’ War. The year, 1632. I had been tempted by Flint’s 1632 series previously, instead deciding to re-read all of Clive Cussler’s offerings instead. After talking to my friend further I was convinced to give his initial book a try. What I find most surprising about this series is the world that has been created at 1632.org in support of the series. Rarely do I get involved with “fan sites” that support a book or more commonly a video game, but this community that supports 1632 has a wealthy of information to offer to support Mr. Flint’s (and contributing writers) alternate reality. Of the main characters, Mike Stearns, mine worker and UMWA member takes control the situation in an attempt to defend their town from neighboring Germany. As the charismatic leader of the Americans, Stearns is well liked, quick to think and decisive when it comes to his decision making skills. Early on in the book, he leads the mine workers against a marauding band mercenaries, which sets the stage for the rest of the book. It’s the ultimate “butterfly effect’ as Grantville, West Virginia was brought into the middle of the Thirty Years War. The citizens of Grantville must quick adapt to their new surroundings of Thuringia or die. Known as “up-timers” these people band together behind charismatic leadership and a desire to survive and thrive in their new homeland as they face challenges. Behind the leadership of Stearns they draw allegiance with Gustav II Adolf, the King of Sweden, as they go against the likes of Spain and underhanded dealings of Cardinal Richelieu in France. Both powerful leaders during this time period, one in which Gustav II Adolf gains the upper hand, thanks in part to the advanced technology. It’s quite amazing to see such support and collaborative efforts put forth by the like Eric Flint, David Weber, Andrew Dennis, Virginia DeMarce, Gorg Huff and Paula Goodlett, along with many individuals who contribute to the 1632 universe at Baen’s Bar (forum) as well as through the Grantville Gazette. Currently I ‘m reading 1634: The Galileo Affair as the transplanted West Virginians continue making an impact in their new surroundings. If you want some entertaining reading that really draws you in, this is a wonderful series. It’s been interesting to read excepts about the Thirty Years War or some of the powerful individuals during that period, along with some of the same scenarios that end up playing out differently than how history originally recorded them in the books brought by Grantville. You can even download 1632 for FREE. It has been an interesting and informative journey for nearly 3 months, now that I have changed my diet, which is really more a lifestyle change. I added another Forks Over Knives documentary today called The Engine 2 ‘Kitchen Rescue’ with Rip Esselstyn, which is available on Netflix. Rip is the son of Dr. Caldwell Esselstyn, surgeon, who “completed one of the most extensive studies on the relationship between the heart and diet–proving that a plant-based diet can reduce and even eliminate heart disease” (source). Currently Rip is employed as a firefighter with the Austin Fire Department. I was introduced to Rip in Forks Over Knives, as his story was used as an example at the firehouse he works at. The fire fighters at Engine 2 had a peer who’s total cholesterol was 344. In a challenge they decided to move to a “plant strong lifestyle.” This documentary explores two families who decide to take the challenge and learn about a plant based, whole food diet. Much like FOK and The McDougall Program, Rip is introduced to the families and prepares them for the change they will experience. The refrigerator and pantry are open and foods that make up the “standard American diet” or SAD are removed. The families are introduced to reading the nutritional facts, as opposed to the label to see what they are eating. A trip to the local market for vegetables and a little education make these families eager to see what flavorful recipes Rip can cook up. As a “SAD” eater I have experienced what these families were going through, looking for recipes that are filling or “having substance” as my wife calls it, as well as having good flavor, while avoiding those foods, such as meat, dairy and oil that are not healthy. Having cooked for 3 months now my library of recipes continue to grow. Initial it was difficult or found it time consuming to put together a good tasting meal that my wife and 6 year old would enjoy and look forward to eating. With the help of the families rip put together a daily menu of breakfast, lunch and dinner for both. Needless to say the meals were quick, easy and from the comments of the families very tasty. For example, the Wali Family was introduced to Ann’s Panani Sandwich with Hummus, Mushrooms and Spinach while the White couple were introduced to am American favorite, which has been made heart healthy, a vegetarian burger with potatoes cut into fries. Both meals made with plant based, whole foods and introducing both to a “plant strong lifestyle” in the kitchen. 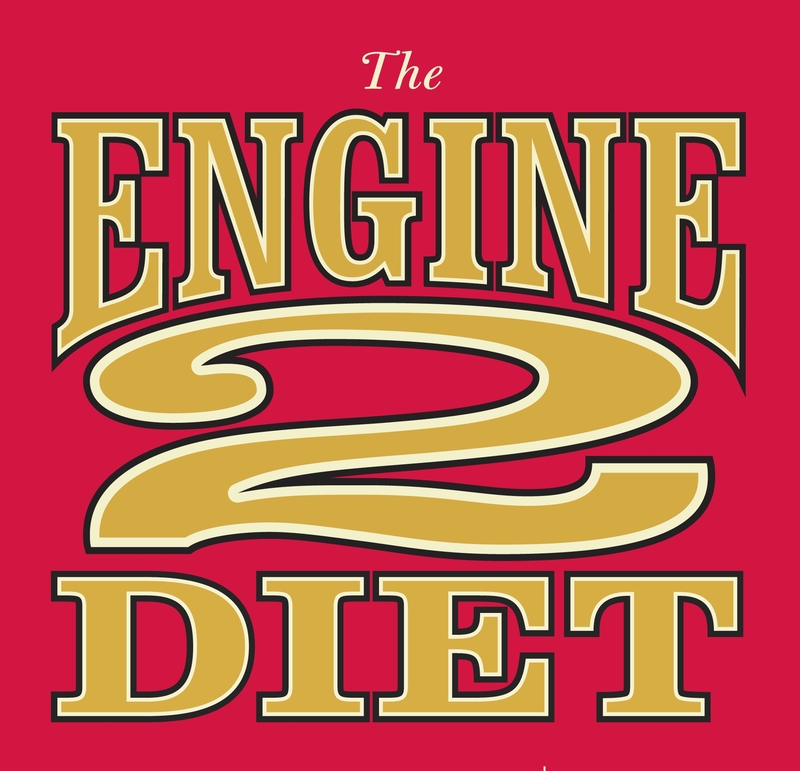 The Engine 2 Diet ‘Kitchen Rescue’ also has a supporting web site that provides some good introductory recipes that are quick and easy for people wanting to take control of their healthy and eat differently. 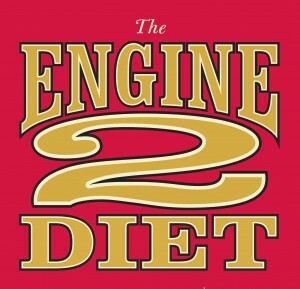 Rip also authored The Engine 2 Diet: The Texas Firefighter’s 28-Day Save-Your-Life Plan that Lowers Cholesterol and Burns Away the Pounds. This book is similar to what Dr. John McDougall outlined in The McDougall Plan. Unlike Dr. McDougall’s 12-day program, Rip provides readers with a 28-day plan to better health. Overall I enjoyed the documentary, which I took as more supporting evidence for a “plant strong lifestyle.” It’s a bit quicker and easier to follow than Forks Over Knives and doesn’t include the numbers, science or studies behind the diet. Rip does a good job of keeping it simple for the family members, while providing them introductory information to what the lifestyle change constitutes. I do have his book on my want list and look forward to reading it. While I am promoting a plant based, whole food diet I won’t push others to join me. It’s a personal decision and one must make a strong commitment and have the desire to change your lifestyle for the betterment of your health. Before adding the movie The Fourth Kind to my queue on Netflix, I did not think much about the movie. It came up as a recommendation because of the background nature of the movie. Alleged alien abduction. I can already see some reader shaking their heads, at such an outrageous claim. Regardless of what you think, I found the movie rather intriguing to view, since I had not done any prior research on the film, it’s background or “real life” story that makes up the plot. *Spoilers ahead* The movie centers around a hosted television interview through Chapman University with Dr. Abigail Tyler, a psychologist in Nome, Alaska who discuss the “fourth kind” of close encounter. Abduction. Tyler, played by Milla Jovovich, best known for her work in the Resident Evil series, records numerous therapy sessions with patients who have similar experiences and claiming to see an owl in the window. After the mysterious death of her husband, Will, she undergoes her own therapy session with Dr. Abel Campos, a psychologist from Anchorage and colleague to Tyler. Her regression session raises questions as to her husband’s disappearance. After hearing similar stories from numerous patients, Dr. Tyler believes they were possibly abducted. After Campos is unable to draw an further conclusions in regression session with Tyler and calls in a language expert after hearing an unidentifiable language recorded. Dr. Awolowa Odusami, an expert in ancient languages and called in by Campos. He identifies the language as Sumerian. It’s the abduction of Ashley, Tyler’s daughter that brings the abduction theory to life, a portion of which is caught on video by a police patrol car that was guarding Tyler’s house after she was confined to her home by the sheriff. Like many alien/abduction based movies you never get that good glimpse of an extraterrestrial or a UFO, but you get what could be discerned as “not of this world.” In each of the regressions, the video scrambles and the audio is broken, as violence seems to erupt in the background. This was the case each time the entity spoke in Sumerian and the UFO took Ashley. In the end, nothing is resolved, the film goes on to discuss each of those involved in the film, leaving the audience to decide. As credit scroll, taped phone calls of people recounting UFO sightings play. If I would have read reviews or followed the movie prior to seeing it, I don’t believe it would of had as strong an impact as it did. The movie is filmed in the same vein as Blair Witch Project of Paranormal Activity, on a low budget and through the use of a home video camera. Still the interspersing of archived video combined with the dramatization is well done and does provide a story from two different angles. I do have an interest in the subject matter I was taken in by the film and when it was over, I thought what I had just seen was the real deal. Guess that is what the director would have wanted. Still, even if you have read reviews and know that what you are seeing is a “hoax” and these incidents in Nome did not happen, the movie still holds entertainment value. I would recommend it for those who take an interest in the abduction theory or like a good paranormal thriller. The movie centers around a chain of disappearances in the remote region of Nome, Alaska from the 1960s to present day. A few years back the FBI was called in to investigate the abnormally high disappearance rate, but their conclusions were somewhat inconclusive. There are some interesting use of split screen, as well as actual video and audio footage to support Dr. Tyler’s claims. At the beginning of the movie Jovovich explains the use of this original material in order to help support the claims made by the movie. Convincing? I guess that is up to you the viewer. I thought it to be rather well done. Of course other Internet based claims are so fond of it. As the story rolls along, Jovovich starts having her own mental issues an sees her shrink, Abel Campos. Through out the movie there seems to be a connection between all the regression sessions we see from the archived footage into the strange and unexplained disappearances in Nome. It becomes evident an extraterrestrial force is at work when Dr Tyler records a late night session of “Scott” while mentally suffering in his home. The video is rather shocking as the regression seems to go wrong, as an unknown voice, a presence is heard through the body of Scott. Enter Awolowa Odusami, a expert in language who recognizes the unknown language on the videos as Sumerian. He long with Campos attempt to work with Dr. Tyler to figure out what happened, not only to her husband but to her.